For my family and me, the blessing came when we received the momentous phone call on the night of January 22: a matching liver was available for my transplant. But, quite honestly, that my life was saved has been perhaps the lesser blessing. The biggest blessing was the Spirit of God that enabled Harold, Bryan, Philip, and Jason, in the throes of grief as they learned their mother Peggy would not survive her sudden stroke at the young age of 59, to make the mutual decision to donate her organs. Their decision saved lives and brought our two families together. We feel so very, very blessed that the Long family has welcomed us into their lives and their family. Meeting my donor family on September 7 was definitely a momentous occasion for me and my family. The two hours spent with eight members of the Long family had some sad yet joyous moments as I heard wonderful stories about Peggy and her love to give and share at special family reunions. She loved to cook, then relax and play with her grandkids. She was a special person. While it has been but six months since we first met, my family has had a chance to meet many of the Longs on numerous occasions, even though we are separated by many miles. They are our extended family, and we are blessed to be able to share moments together. 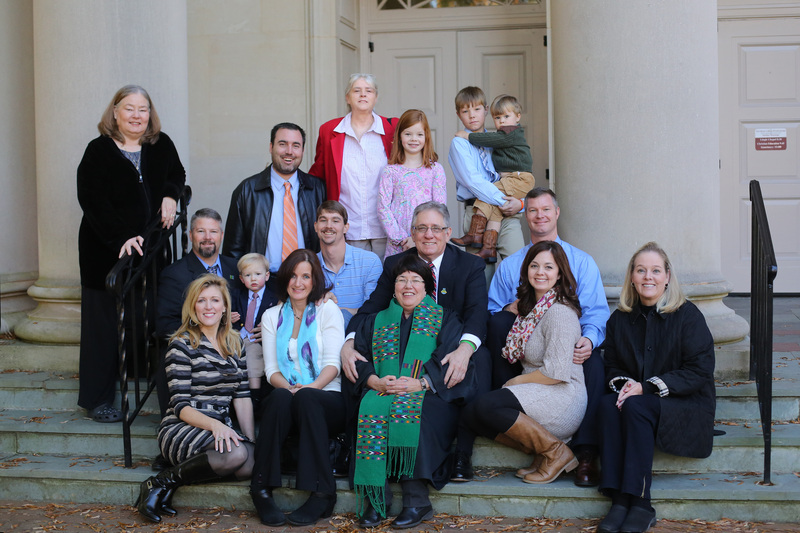 On November 10, 2013, our church, Davidson College Presbyterian, celebrated National Donor Sabbath, and 11 members of the Long family attended. At the benediction, my wife, Pastor Lib McGregor Simmons, gave me the opportunity to come to the lectern and introduce each of them, along with my two sisters. I will never forget that moment. You see, my other extended family at DCPC, members who prayed and help support my trial along the way, got to meet the Longs. A standing ovation that lasted a while followed, and then the members swarmed them, giving hugs, handshakes and warm thankful greetings. For the Long family, I believe Peggy provided them countless blessings from what I've heard: she fiercely loved her sons, daughters-in-law, sister, brothers and grandchildren. She was strong, gave fully, and cooked them all fantastic meals. In return, the family answered the question - “What is God calling us to give?” - by agreeing to allow a part of her to live on in the body of someone else. My donor and donor family are my heroes, and this blessing will never be forgotten.